Hempguard CBD & hemp based products, hand made from the heart of Somerset. There we go introductions done! 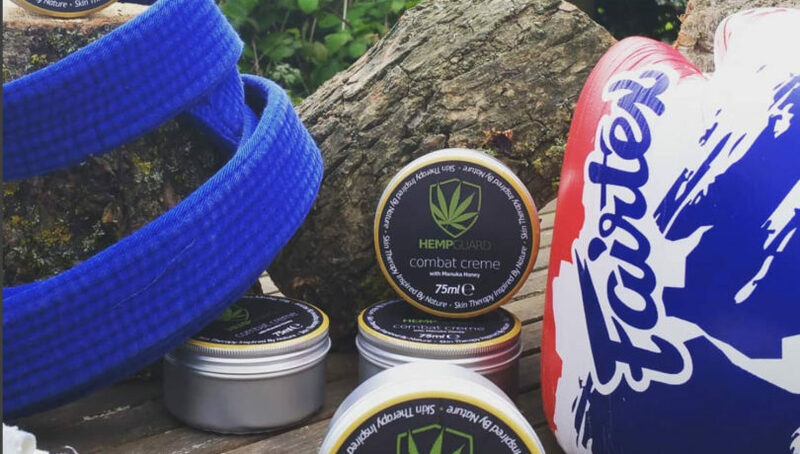 Well not totally…….. Hempguard is a small homegrown company born from the ideas of Kelly who is a Jiu Jitsu blue belt at GB Street. I don’t know the whole ins & outs of Kelly’s injury but I do know that she had an on going injury & was constantly using prescription medication & pain killers but after using CBD & hemp products I know she is now prescription med free & from there looked into developing her own brand. Now I’m not going to jump in both feet & preach that Hempguard & CBD is some miracle cure but from what I’ve personally experienced using certain products, read & the amount of information getting out there & even hearing now that GP’s are directing people (long term arthritis sufferers that I know) towards CBD then it’s starting to really back up its own stories. It’s great for anxiety, pain relief, recovery, to help sleep & the list goes on. I personally can’t say enough about this product! I was going to write this review for Attack The Back just after I got my first tin of Hempguard Muscle Rub but I’m glad that I’m doing it now 4 tins, a few months, a couple of comps & lots & lots of gruelling training sessions later. It’s a natural balm/salve made of 1000mg of CBD oil, arnica oil, Organic beeswax, Hemp oil, essential oils & a bit of menthol. I use it before & after training but mostly about an hour before, mainly on my knees as being an electrician by trade I spend a lot of time crawling through lofts & kneeling so my knees ache a lot & that’s before I even think about going training. I had surgery on my left knee at xmas as well so that’s still not 100% yet but applying the muscle rub definitely helps with pain relief. I also suffer a bit with an old injury to my right forearm, elbow area so massaging the muscle rub into that area really helps with the pain associated to the constant gripping & grabbing of grappling & after training it certainly helps recovery. I use it the morning after training sometimes if we’ve done a lot of stand up drills, wrestling, throws etc again mostly on my knees. I find it works way better if you spend a good 5-10 minutes massaging it into whatever affected area. It’s called a muscle rub but I use it more on my joints than anything. It smells amazing & has a mild menthol feel when applying but nothing like a Deep Heat or Thai oil, no burning sensation which to be honest I prefer. It’s not just for sports people though, I know people have bought it for elderly relatives who suffer with joint pain & arthritis etc & have had great results. Hempguard has, since its birth in February 2018, introduced a couple more products onto the market. Shower/bath washes, The Combat Creme, which again is 1000mg of CBD oil but with Manuka honey in a more gentle cream & have now just brought out their own ‘Dope Soap’ even available on 100% organic hemp rope which I’m looking forward to trying. I have used the shower wash & the Combat Creme & I can definitely say they’re both great products but I wanted to focus more on the muscle rub here as that has been my go to product day in day out now since I’ve first used it. I highly recommend it. I have one constructive criticism about the Hempguard products I’ve got my hands on, well it’s not actually about the product itself more the packaging, well labelling. I’d say that they could do with making a sharper, higher definition label on the Muscle Rub tin as it’s hard to read the writing on the back of the tin & the paper labelling on the bath/shower wash bottles soon ends up just soggy & falling off but to be honest that is my one & only criticism of the Hempguard stuff I’ve used so far & is an easy fix for a company that’s in its early phase of trading. You can check out Hempguard on their Facebook page & on Instagram @hempguarduk. Contact Kelly for anymore info on their list of products & prices.